Comprehensive in its scope and design, our curriculum will guide your child in a systematic and progressive fashion: from sight-reading single words, to sounding out groups of words, to reading complete stories by the end! 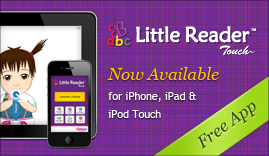 The Little Reader curriculum spans a period of one year, with two semesters of six months each. Based on a five-day week, each semester comprises 130 days of lessons. Every day one word will be retired and one new word added to each category of your lessons. When the end of a category is reached, the first word retired will return. IMPORTANT NOTE: Little Reader Deluxe only comes with books and printed material which use American English spelling rules. Picture Flash lessons teach the meanings of words by flashing pictures. Pictures will auto-forward rapidly and take less than a minute to play. What's good about this method? Multisensory lessons show each word followed by a picture and sometimes a video to reinforce the meanings of words. This is the part where you can take a leisurely pace and interact with your child the most - you control the speed of the lessons by using your mouse or keyboard to go through the slides. What's good about this method? Pattern Phonics™ lessons show groups of color-coded words with varying vowel and consonant clusters. Your child will not only learn to sight-read, but will also be guided to decode the written language in an intuitive manner. What's good about this method? Word Flash is used to teach words through the flash method. Words will auto-forward rapidly and take less than a minute to play. What's good about this method? Word Split lessons are pretty much like Multisensory lessons, but the difference is that the words will be displayed and read out in parts - sometimes words are split into syllables, and sometimes a specific letter or blend is isolated. What's good about this method? Little Reader includes simple stories which use words from the curriculum, so starting from the second half of the curriculum (Semester 2), your child will learn to read not only simple sentences, but even complete stories! Story Time also lets you teach your child at your own pace by manually moving between each sentence in the stories. What's good about this method? To make reading time even more exciting, you and your child can play a picture or word game at the end of each lesson! What's good about this method?